The king of pop art, a universally renowned and hugely influential 20th century artist, whose work is continually exhibited, Andy Warhol (1928 -1987) was prolific: he worked in painting, photography, cinema, television and performance, and as a music producer and magazine editor. Warhol’s career began in 1949, when he moved to New York. He was then working as an illustrator for various magazines and his first commissions were as an adman. The 1960s would be his glory days – his tins of Campbell’s soups and portraits of celebrities even attained iconic status. His earliest artwork dates back to the 1950s. 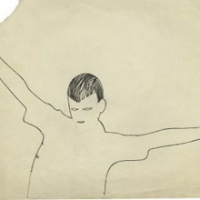 Warhol was then practicing his draughtsmanship, copying out photographs found in the American magazine LIFE. These drawings remained unrecognised until they were discovered in 2011 by the German gallery owner Daniel Blau. Over a hundred of them have been brought back together in this exhibition, which casts new light on the wellsprings of Warhol’s work. Through drawing, Warhol developed a visual language, sublimating reality and exploring the idea of a body of work that is both iconic and reproducible. Public guided tours and lectures are held periodically at the museum. On request, guided tours can be arranged for groups of up to 25 people. Please make your reservations by phone or email, at least one week in advance! For further information please click here to visit the museum’s website. The exhibition has been organised in collaboration with the Daniel Blau gallery, Munich and ETH, Zurich’s collection of engravings and drawings. It has been supported by the Le Cèdre Foundation and the Fondation Bonhôte pour l’art contemporain.